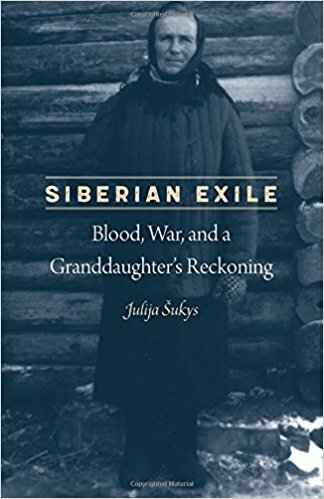 Julija Šukys’ Siberian Exile: Blood, War, and a Granddaughter’s Reckoning (University of Nebraska Press, 2017) is a book both about storytelling and about the inability, sometimes, to tell stories. Šukys attempts, in this book, to reconstruct the lives of her Lithuanian grandfather and grandmother, but in so doing, she discovers family and political secrets that unsettle the project and her relationship to her past, to the past of her family, and to the act of narrating history itself. I understand this process well, having spent much time in recent years trying to reconstruct my father’s family’s history during and after the Holocaust in Hungary. I understand how slippery the past is, how just when you think you’ve figured something out, the story changes. This is true both for family narratives and official, historical ones. So it was with a sense of empathy and deep understanding that I read this book. Siberian Exile is divided into three sections: one focusing on Anthony, her grandfather; one about Ona, her grandmother; and one called simply “Us,” about herself and the rest of the family. These different strands capture one of the narrative’s central realities: there are different perspectives on what happened during and after World War II. The book attempts to weave together these multiple stories while acknowledging that they are at times contradictory. Šukys discovers, primarily through researching old KGB records, a disturbing secret: her grandfather collaborated with German soldiers as they rounded up and killed Jewish Lithuanians during the war. The records she initially finds suggest that he was responsible for actually killing Lithuanian Jews, but she’s not able to prove the truth of those records. What does seem certain, at the very least, is that he did not resist as Jews were being killed. I imagine Ona came into her own in Siberia. Distance and hardship either forced or allowed her to locate a power within herself. The wife of an authoritarian and militaristic man, she must have deferred to her husband for years before her arrest. But in a strange and surprising way, Siberia made her mighty. In exile, it seems, her grandmother might have escaped a worse fate. It’s a strange irony in a book full of twists, turns, and convergences. Šukys travels to Siberia, retracing her grandmother’s train journey from her village in Lithuania to the Siberian village where she’d live for the next several decades. Šukys interviews people who knew her grandmother, and she visits the site where her grandmother’s cabin once stood, connecting her physically and emotionally with her grandmother’s past. The third section brings the book back to the present, to the aftermath of the war. It follows her grandmother and grandfather as they eventually find their way to Canada, reuniting with each other and with their now-grown children. It also brings us to the writer’s final attempts to make meaning out of all she’s learned about her grandparents’ past. What she discovers, however, is there’s no neat way to wrap everything up. There are many unanswered questions, unknown facts, and things that still, despite all of her research, must be imagined. The book ends with her listening to a recorded interview with her grandmother, who tells a story of a friend of hers in exile eating charcoal from the fire and washing its bitterness down with water: “My grandmother’s voice washed over me, and suddenly I too tasted the ash in my mouth.” It’s a fitting metaphor for her work throughout this book. In uncovering and trying to make sense of the past, Šukys is left only with the past’s imprint on the present – the taste of history’s ashes in her mouth.